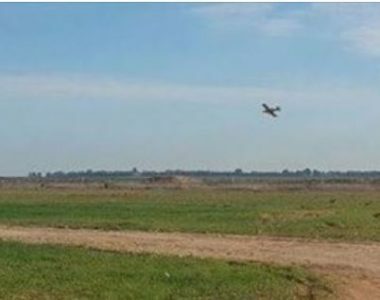 Israeli army planes sprayed, Wednesday, Palestinian farmland in the eastern part of the Gaza Strip, with toxins and chemicals, wounding three Palestinians. Medical sources in Gaza said the Palestinians suffered chemical burns, severe shortening of breath, and various types of allergies after being exposed to the Israeli toxins, while working on their lands, near the border area, in the eastern part of the coastal region. toxins which were sprayed by the Israeli planes, to conduct the needed lab analysis. The incident is part of a series of violations targeting the Palestinians and their lands, especially in areas close to the border fence, in the improvised Gaza Strip. The understandings between the great powers are not accomplished through long summits between two presidents, because such of these meetings are a sign of the depth of the disputes on one hand, and the will to understand on the other hand. They led to bridges on which the experts, consultants, senior diplomats and military depend, while the understandings are made by those, and when they are accomplished they are only in need of a mutual smile between the two presidents, signs of body language, and exchange of some words of assertion on the determination and credibility in going on in the understandings with consent and acceptance. This is what we saw in the previous long summits between the Presidents of Russia and America, and what we saw in the statement of the Russian-American understanding about Syria. The understanding on Syria cannot be achieved without a comprehensive understanding on three organically linked files, the first of which is an understanding about Washington’s file of concern which is represented by the missiles of the North Korea and its military nuclear file, its basis is to stick to the understanding on the Iranian nuclear file as a valid example for North Korea rather than the escalation against Iran, which the leader of Korea says that possessing the nuclear missiles is his guarantee not to be exposed to what Iran is exposed to, while the required is the contrary to make the Koreans see that the example of Iran is attractive, because it gets advantages, roles, and smooth relations because it commits to the ceilings of the international understandings, and that the surrounding guarantees of the signed understanding make it stable. The understanding on Syria is related to the understanding on how to reduce the opposition and disobedience from the Saudi and the Israelis parties, the encouragement of the former to engage in a negotiating choice will lead into a political solution in Yemen, and the encouragement of the latter to engage will lead to a negotiating solution with the Palestinians. The solution in Syria is drawn by the post-ISIS phase which imposed its logic, but the elements of pressure which accompanied it accelerate to ask questions which the former US Ambassador in Syria Robert Ford has given preemptive answers to them, by saying that Washington has to ensure the participation of the Kurds in the Syrian political solution, and to be ready for the US military exit from Syria otherwise to go to comprehensive war, which it is supposed that those who wanted it to wage it under more attractive titles than supporting the Kurds. It is good for Washington to entrust Moscow with the solution in Syria, it is a solution under political ceiling entitled the elections after a new constitution, as stated by the resolution issued by the UN under Russian-American consent. According to Russia, the Turkish role in the North is important as a guarantee to cooperate in ending Al Nusra front on one hand, and for the Kurdish participation in the political solution under Turkish consent that ensures subsequent Turkish withdrawal from Syria after being reassured for the Turkish national security on the other hand. In contrast the Iranian role in the South is not under Russian bargaining in order to get the satisfaction of the Americans and the Israelis. The Russian President has already told the Head of the occupation government two months ago that Iran is filling a regional vacancy in Syria, so its participation in the political solution will make its presence positive even to its opponents, because it participates in bearing the responsibility of maintaining stability and keenness on balance in dealing with the Syrian components. Despite the indicators of wars and the signs of escalation, the meanings of Moscow-Washington understanding cannot be ignored, and it cannot be ignored also the Kurdish retreat in Iraq from the secession in a recorded time without an ignition of an American –Israeli- Saudi war which was the only opportunity for a war, moreover it cannot be ignored the Saudi retreat in Lebanon and the Saudi retreat in the file of besieging Yemen and the need to observe the Israeli alert and the objection of the content of the compromises, in addition to the intention on intervention when the Israeli interest calls, as a repetition of what the Israelis already said with signing the understanding on the Iranian nuclear file. Many people in Washington say that strengthening the Iranian regional role as a guarantor of stability is more than a message to encourage the North Korea to accept the language of settlements, it is an investment on the relationship with a rising power and the willingness to deal with the retreat of the regional allies who live the phase of end despite the arrogance, denial, and the crazy acts. – لا تنجز التفاهمات بين الدول الكبرى بقمم طويلة بين الرئيسين، ومثل هذه اللقاءات عند حدوثها تكون علامة على عمق الخلافات من جهة وإرادة التفاهم من جهة أخرى، فتنشئ جسوراً يتابع على أساسها الخبراء والمستشارون وكبار الموظفين الدبلوماسيين والعسكريين أما التفاهمات فيصنعها هؤلاء، وعندما تتمّ وتنجز، لا تستدعي إلا ابتسامة متبادلة بين الرئيسين وإشارات بلغة الجسد، وتبادل بعض الكلمات التأكيدية على العزم والصدقية في السير بالتفاهمات بالرضا والقبول. وهذا ما رأيناه في القمم السابقة الطويلة بين رئيسَيْ أميركا وروسيا، وما رأيناه مع بيان التفاهم الورسي الميركي الأخير والقمة عاأأيناه في بيان التفاهم الروسي الأميركي حول سورية، و«القمة عالماشي وعالواقف وعالجالس»، مع تربيت على الكتف وشدّ بالأيدي وابتسامة ونظرات متبادلة. – التفاهم حول سورية لا يمكن أن يتحقق من دون تفاهم شامل على ثلاثة ملفات رديفة مرتبطة عضوياً به، أوّلها تفاهم حول الملف المؤرق لواشنطن المتمثل بصواريخ كوريا الشمالية وملفها النووي العسكري، قوامُهُ التمسك بالتفاهم على الملف النووي الإيراني كنموذج صالح للتطبيق مع كوريا الشمالية، بدلاً من التصعيد بوجه إيران الذي يقول لزعيم كوريا إنّ امتلاك الصواريخ النووية هو ضمانته لعدم التعرّض لما تتعرّض له إيران، بينما المطلوب العكس، أن يرى الكوريون أنّ مثال إيران نموذج جاذب بما تناله من ميزات ومن أدوار ومن انفراج في العلاقات، لأنها تلتزم سقوف التفاهمات الدولية، وأنّ الضمانات المحيطة بالتفاهم الذي وقعته تجعله غير قابل للاهتزاز، وفي المقابل يرتبط التفاهم حول سورية بالتفاهم على كيفية تخفيض حركة الاعتراض والمشاغبة من الفريقين السعودي و«الإسرائيلي»، وتشجيع الأول على الانخراط في خيار تفاوضي يؤدّي لحلّ سياسي في اليمن، وتشجيع الثاني على الانخراط بحلّ تفاوضي مع الفلسطينيين. – إطار الحلّ في سورية ترسمه مرحلة ما بعد داعش، التي فرضت منطقها، وتسارعت عناصر الضغط المصاحبة لها، في أسئلة سبق وقدّم السفير الأميركي السابق في سورية روبرت فورد أجوبة استباقية عليها، بقوله إنّ على واشنطن ضمان مشاركة الأكراد في الحلّ السياسي السوري، والاستعداد للخروج الأميركي العسكري من سورية، وإلا فالذهاب إلى حرب شاملة، كان يفترض بمن يريدها أن يخوضها تحت عناوين جاذبة أكثر من دعم انفصال الأكراد، وخير لواشنطن أن تتعهّد موسكو الحلّ في سورية، وهو حلّ تحت سقف سياسي عنوانه الانتخابات بعد دستور جديد، كما نصّ القرار الصادر عن مجلس الأمن الدولي بتوافق روسي أميركي. – الدور التركي شمالاً عنصر هامّ من وجهة النظر الروسية كضمان للتعاون في إنهاء جبهة النصرة من جهة، وتلازم الحلّ للمشاركة الكردية في الحلّ السياسي بقبول تركي، يضمن انسحاباً تركيا لاحقاً من سورية وفق معادلة الاطمئنان للأمن القومي التركي، وفي المقابل فالدور الإيراني جنوباً ليس موضع مساومة روسي لإرضاء الأميركيين و«الإسرائيليين». فقد سبق وقال الرئيس الروسي لرئيس حكومة الاحتلال قبل شهرين إنّ إيران تملأ فراغاً إقليمياً في سورية ومشاركتها في الحلّ السياسي يجعل حضورها إيجابياً، حتى بالنسبة لخصومها، لأنه يشاركها بتحمّل مسؤولية حفظ الاستقرار، والحرص على التوازن في التعامل مع المكوّنات السورية. – رغم كلّ ما يبدو من مؤشرات الحروب، وإشارات التصعيد، لا يمكن تجاهل معاني إعلان موسكو وواشنطن عن تفاهم وصفاه بالتاريخي، ولا تجاهل التراجع الكردي في العراق عن الانفصال بزمن قياسي من دون تحرّك لحرب أميركية و«إسرائيلية» وسعودية كانت وحدها فرصة حرب لها أفق، ولا كذلك تجاهل التراجع السعودي أمام لبنان، والتراجع السعودي في ملف حصار اليمن، والحاجة للنظر نحو حال الاستنفار «الإسرائيلية» والاعتراض على مضمون التسويات، والحديث عن العزم على التدخل حيث تدعو المصلحة «الإسرائيلية» التدخّل، بصفته تكراراً لما سبق وقاله «الإسرائيليون» مع توقيع التفاهم على الملف النووي الإيراني. – كثيرون في واشنطن يقولون اليوم إنّ تعزيز الدور الإيراني الإقليمي كضامن للاستقرار، هو أكثر من مجرد رسالة تشجيع لكوريا الشمالية لقبول لغة التسويات، بل هو استثمار على العلاقة بقوة صاعدة والاستعداد للتعامل مع تراجع الحلفاء التقليديين الذين يعيشون زمن الأفول رغم المكابرة والإنكار وما فيهما من حفلات جنون. 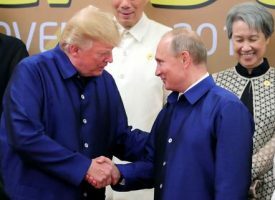 President Trump and President Putin today, meeting on the margins of the APEC conference in Danang, Vietnam, confirmed their determination to defeat ISIS in Syria. They expressed their satisfaction with successful US-Russia enhanced de-confliction efforts between US and Russian military professionals that have dramatically accelerated ISIS’s losses on the battlefield in recent months. The Presidents agreed to maintain open military channels of communication between military professionals to help ensure the safety of both US and Russian forces and de-confliction of partnered forces engaged in the fight against ISIS. They confirmed these efforts will be continued until the final defeat of ISIS is achieved. The Presidents agreed that there is no military solution to the conflict in Syria. They confirmed that the ultimate political solution to the conflict must be forged through the Geneva process pursuant to UNSCR 2254. They also took note of President Assad’s recent commitment to the Geneva process and constitutional reform and elections as called for under UNSCR 2254. The two Presidents affirmed that these steps must include full implementation of UNSCR 2254, including constitutional reform and free and fair elections under UN supervision, held to the highest international standards of transparency, with all Syrians, including members of the diaspora, eligible to participate. The Presidents affirmed their commitment to Syria’s sovereignty, unity, independence, territorial integrity, and non-sectarian character, as defined in UNSCR 2254, and urged all Syrian parties to participate actively in the Geneva political process and to support efforts to ensure its success. Finally President Trump and President Putin confirmed the importance of de-escalation areas as an interim step to reduce violence in Syria, enforce ceasefire agreements, facilitate unhindered humanitarian access, and set the conditions for the ultimate political solution to the conflict. They reviewed progress on the ceasefire in southwest Syria that was finalized the last time the two Presidents met in Hamburg, Germany on July 7, 2017. The two presidents, today, welcomed the Memorandum of Principles concluded in Amman, Jordan, on November 8, 2017, between the Hashemite Kingdom of Jordan, the Russian Federation, and the United States of America. This Memorandum reinforces the success of the ceasefire initiative, to include the reduction, and ultimate elimination of foreign forces and foreign fighters from the area to ensure a more sustainable peace. Monitoring this ceasefire arrangement will continue to take place through the Amman Monitoring Center, with participation by expert teams from the Hashemite Kingdom of Jordan, the Russian Federation, and the United States. The two Presidents discussed the ongoing need to reduce human suffering in Syria and called on all UN member states to increase their contributions to address these humanitarian needs over the coming months. ألمانيا: لبنان ليس ألعوبة بيد السعودية! It is essential that a policy be constructed in order to move the country towards security, peace and prosperity, and this, so far, has involved an increase in US combat troops and expansion of the aerial bombing campaign. According to the US Air Force, 3,554 bombs and rockets were directed at targets in the first ten months of 2017, including 653 in October, the greatest number since November 2010. Some of the most recent strikes were on 10 supposed drug-production facilities in Helmand Province, and the complexity and expense of the operation were considerable. 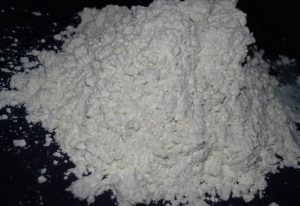 According to Nicholson there are 400-500 opium production facilities in Afghanistan, so there is some way to go before the drug evil is eradicated at the factory stage, and if the effort to destroy them is confined to air power, the cash cost is going to be prodigious. The bombing included strikes by some Afghan air force Tucano aircraft, but the main assault was by the US Air Force which for the first time in Afghanistan used its F-22 Raptor aircraft, flown from the United Arab Emirates, and B-52 strategic nuclear bombers based in Qatar. F-16s joined in from the Bagram base near Kabul, and the operation also involved KC-10 and KC-135 refuelers, surveillance aircraft and command and control aircraft. While it is laudable that General Nicholson wants to minimise collateral damage by using 500 pound bombs, he appeared to veer off course slightly and showed a video of “another B-52 strike on another Taliban narcotics production facility. Now, this particular facility was the largest one we struck last night [November 19], with over 50 barrels of opium cooking at the time of the strike… So this was a B-52 strike, several 2,000-pound bombs, and it completely obliterated the facility.” Presumably the 2000 pound bombs were also precision-guided, in order to avoid collateral damage in accomplishment of complete obliteration. The general noted that in Afghanistan “We’ve dropped more munitions this year than in any year since 2012. These new authorities give me the ability to go after the enemy in ways that I couldn’t before” and he intends to expand the bombing campaign next year. Of course the US air force should not target Afghan farmers — but bombing opium factories will not result in financial ruin of the Taliban. The heroin industry is extremely lucrative, and in Afghanistan the beneficiaries include very many more people other than Taliban adherents. It is, after all, the eighth most corrupt country in the world. After the Helmand blitz, Reuters reported a poppy farmer, Mohammad Nabi, as saying that “The Taliban will not be affected by this as much as ordinary people. Farmers are not growing poppies for fun. If factories are closed and businesses are gone, then how will they provide food for their families?” Has General Nicholson got an answer to that? What a shambles. And Washington’s solution is to bomb it. Nicholson said that farmers “are largely compelled to grow the poppy and this is kind of a tragic part of the story.” Of course the farmers are “compelled to grow” a crop for sale. And it’s more than “kind of tragic.” It’s a catastrophe, because Afghanistan remains the world’s leading producer of opium. In March 2012 Donald Trump tweeted that “Afghanistan is a total disaster. We don’t know what we are doing. They are, in addition to everything else, robbing us blind.” Little has changed, except that 45 percent of Afghanistan’s districts are controlled or contested by the Taliban, and General Nicholson acknowledges that “we are still in a stalemate.” But Trump has been persuaded to declare that the US will “fight to win”. So the campaign of airstrikes will continue, and Afghanistan will be bombed towards peace and prosperity. It is well known to anyone who spends even the smallest amount of time researching the Syrian conflict that the United States and Britain have been providing support to not only the White Helmets but also to terrorist groups such as al-Nusra, ISIS, and al-Qaeda among others. 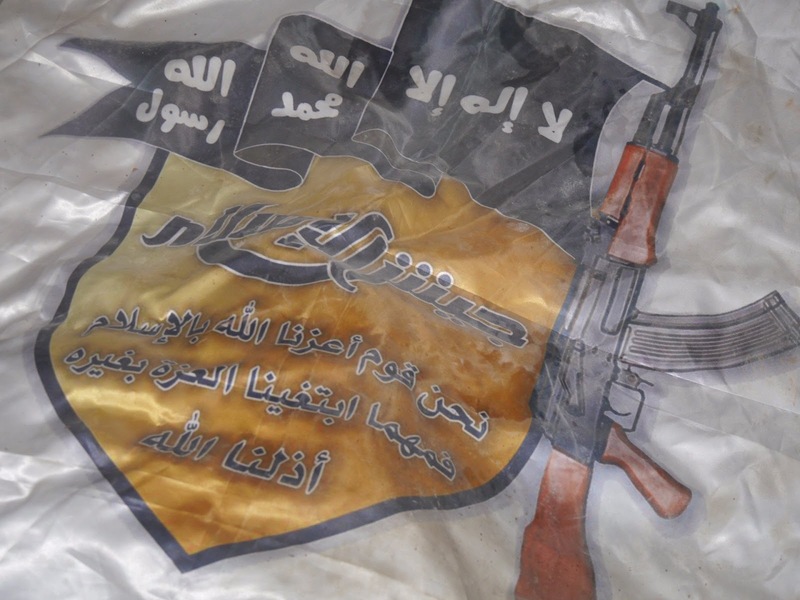 Indeed, ample evidence shows that the White Helmets are nothing more than a support group for al-Nusra, essentially acting as a propaganda wing of the organization. In other words, it is evident enough to anyone who examines the situation closely that the White Helmets and Nusra are the same organization. The journalist who has contributed the most to exposing the White Helmets fraud, Vanessa Beeley, has traveled to Syria on numerous occasions, bringing back video and photo evidence clearly demonstrating the link between these two groups. I also traveled to Syria in October, 2017 and was able to get a look at the East Aleppo al-Nusra Front compound for myself. Although Beeley’s images and video are damning, there is nothing like being in the compound yourself to really get a grasp for just how interconnected these two groups are with one another. 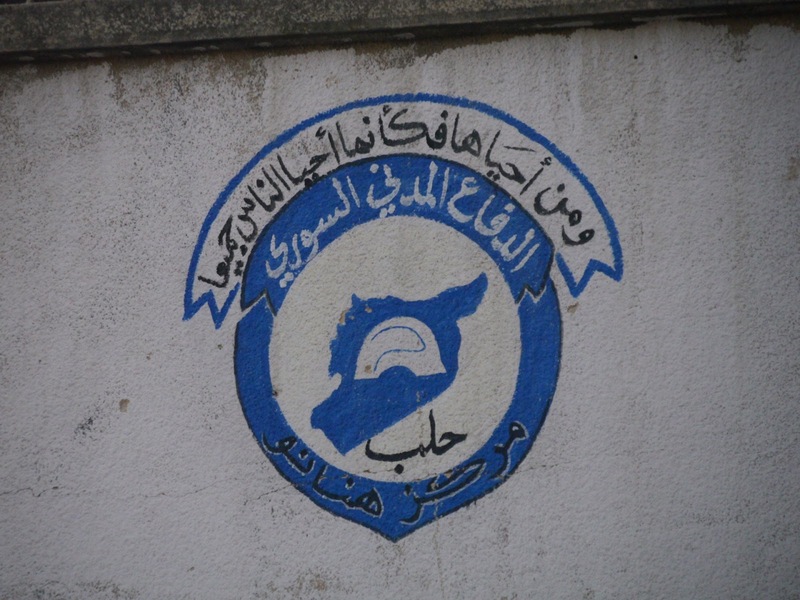 As I stood in the courtyard of the East Aleppo al-Nusra Front headquarters (formerly a school compound occupied by terrorists in hopes of using the facility as cover and great PR if ever it was to be bombed), I was struck by just how obvious it was that the White Helmets and al-Nusra were the same organization. To be clear, the same compound that al-Nusra Front occupied and maintained as their own headquarters was also serving as the headquarters of the White Helmets. This presents another ready made propaganda gift since, when eliminating the terrorists from the compound, the Syrian army could be accused of bombing not only a school but selfless humanitarian rescuers. In this compound, I found plentiful leftover medical supplies provided by Western countries, particularly England, Japan, Norway, Qatar, Saudi Arabia, Turkey, and the European Union. 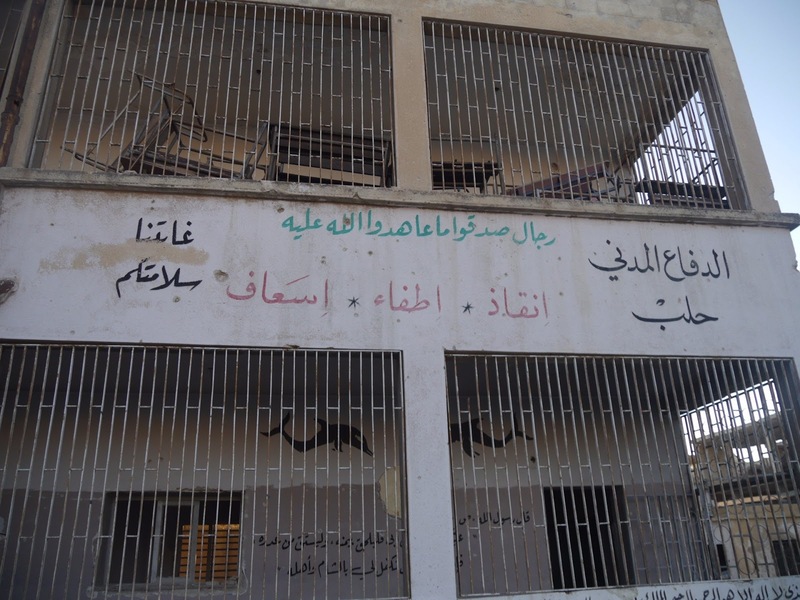 Even within the White Helmets facility, terrorist flags and graffiti were all over the building, some left haphazardly on the ground during battle, some still tacked up on the wall. Vanessa Beeley recorded a panorama video of the compound which can be viewed here which clearly shows the proximity of the two buildings to one another. Anyone who sets foot in this compound will have absolutely no doubt left in their mind that the White Helmets and al-Nusra are the same organization. There will also be no doubt that the Western corporate media has done nothing but lie and deceive their audiences as to the nature of the White Helmets and the entirety of the so-called “rebels” in Syria.